A little while ago, I set myself a challenge of creating seven maps over the period of a week, posting a new map each day on my Facebook and Twitter. It was challenging to complete each resulting map within the short space of a day, but were well worth the positive feedback and skills learnt. Here’s a summary of all the maps I made during the challenge in one place. Enjoy! 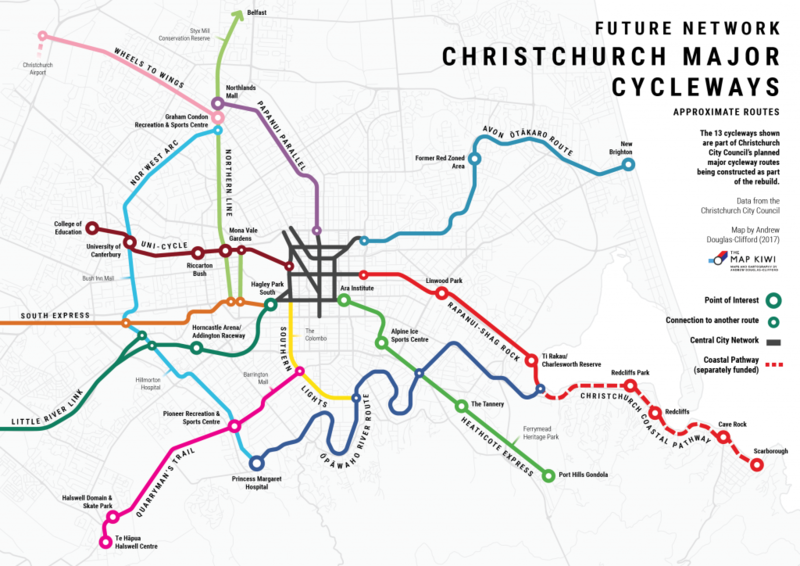 A map showing the major cycling routes that the Christchurch City Council is in the progress of constructing across the city. 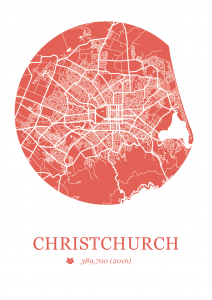 The bright route colours are reminiscent of a metro map, but with a much higher degree of geographical accuracy of the routes. Places of interest along the routes are represented by friendly bubbles, creating a circuit board-like appearance where paths meet and intersect. 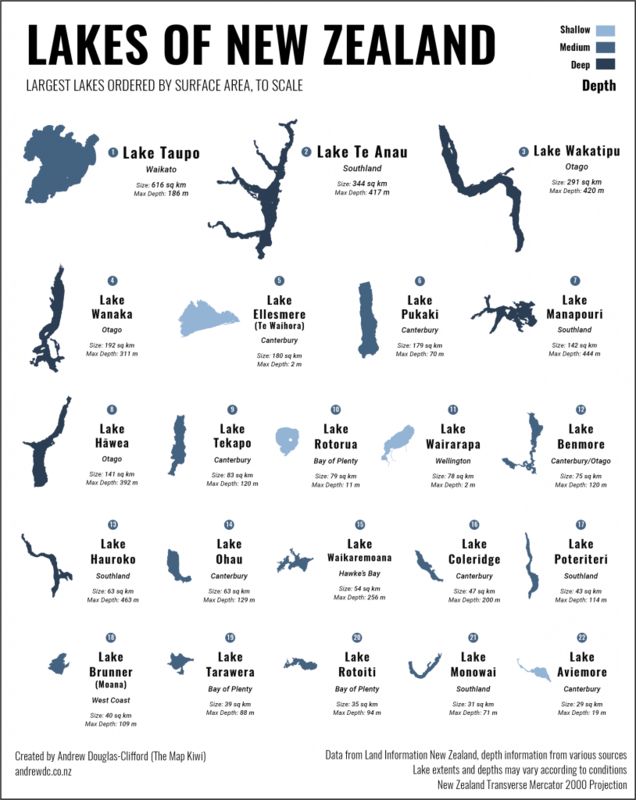 This one ended up being closer to an infographic than a traditional map, but came together beautifully as an effective visualisation of lake area size and depth, represented by order and colour respectively. 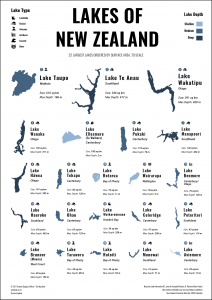 Direct comparisons of lake size was eye opening as well; I had no idea how much longer Lake Te Anau and Lake Wakatipu were in comparison to Taupo, NZ’s largest lake. 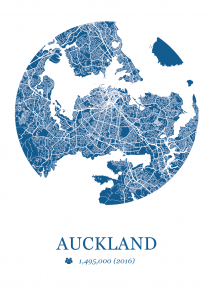 My goal for this map was to put a twist on the familiar Wellington coastline by showing the dramatic impact of a 9 metre rise in sea level on the city. 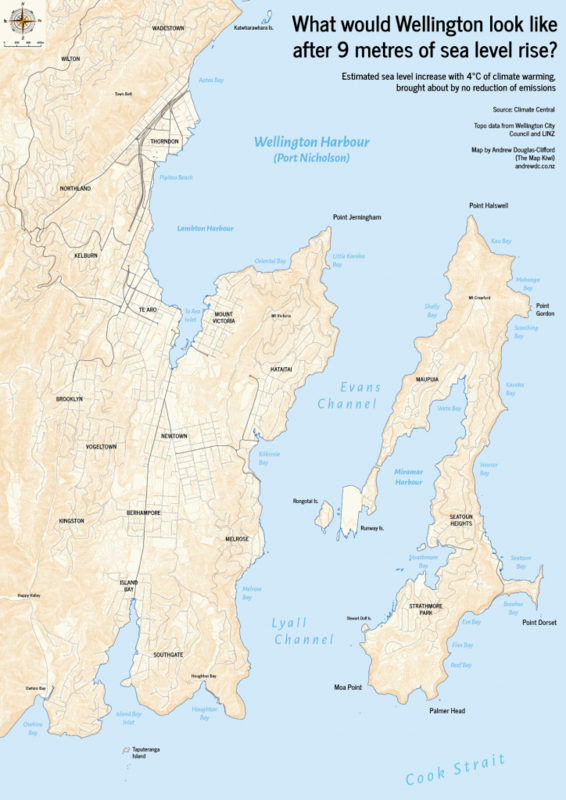 Evans Bay and Lyall Bay are now connected, Miramar has become a harbour and shoreline of Lambton Harbour resembles something closer to its historic boundary. 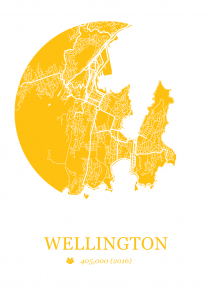 LIDAR contour data provided by the Wellington City Council meant that it was possible to derive this hypothetical new coastline with high accuracy. 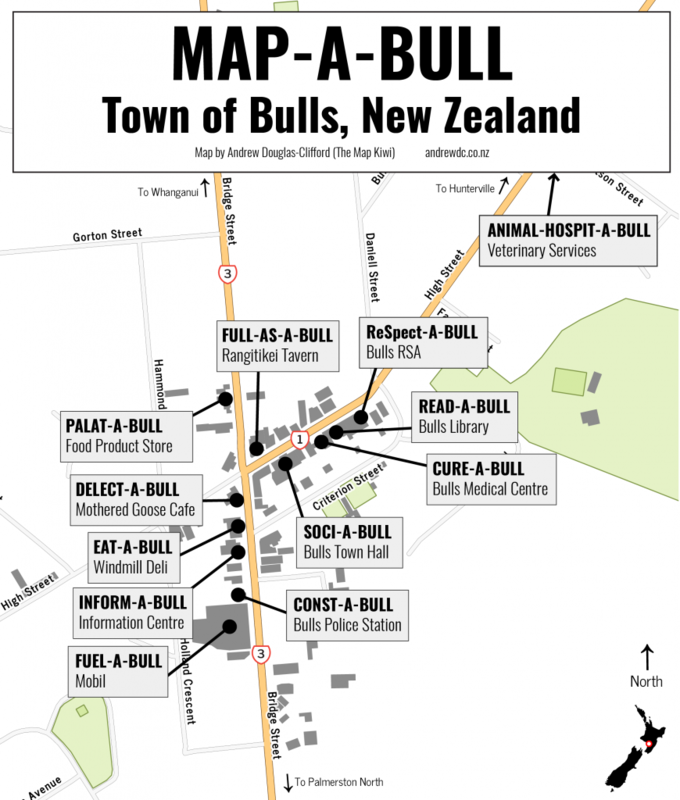 The town of Bulls, located near the west coast of the North Island, is widely known for their bullish marketing of the town’s amenities. This map points out many of the pun-related (and real!) names of locations throughout the town. Unbelieva-bull! 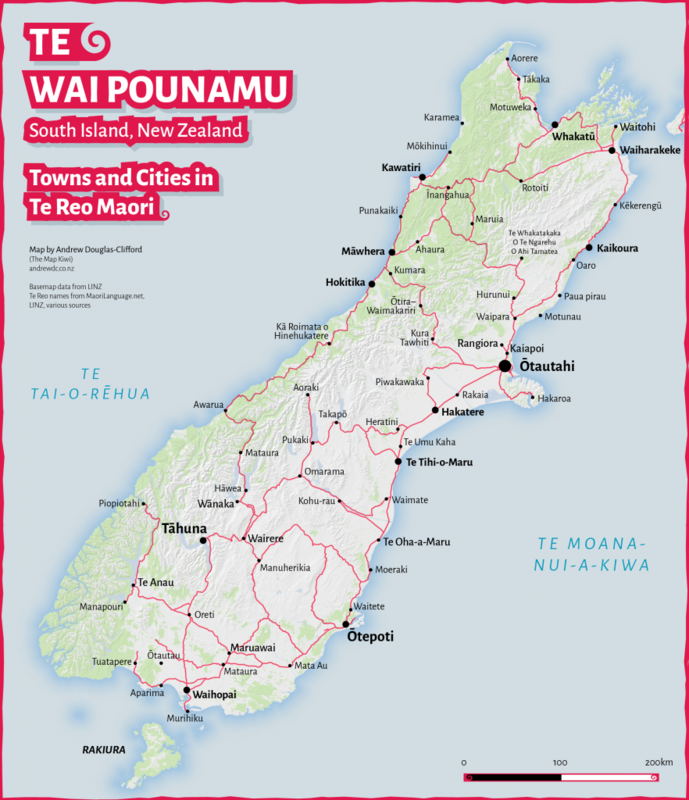 These ones were some of the most challenging ones to complete within a day, due to the amount of research required in finding the Te Reo names of places. I’m very happy with how it turned out though, and thanks to everybody that contributed corrections! 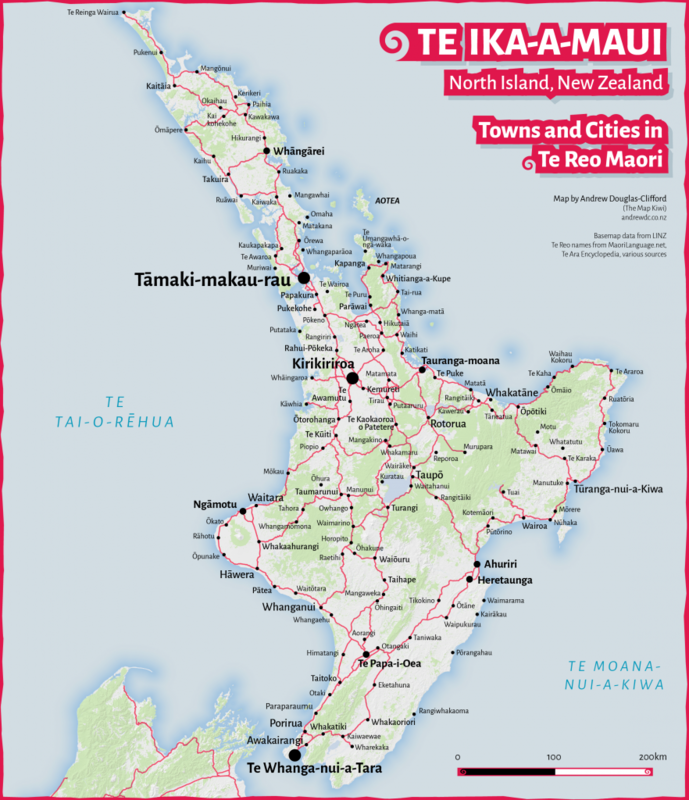 Update: A researched and updated Te Reo Maori Map of New Zealand is now available as a print! For the last day, I focused on something minimal and beautiful. And circles of course, who doesn’t love those? 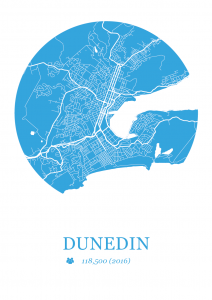 The silhouettes of New Zealand cities using roads and coastlines made a perfect choice, for something I like to call ‘Map Dots’. They’re on the store right now! 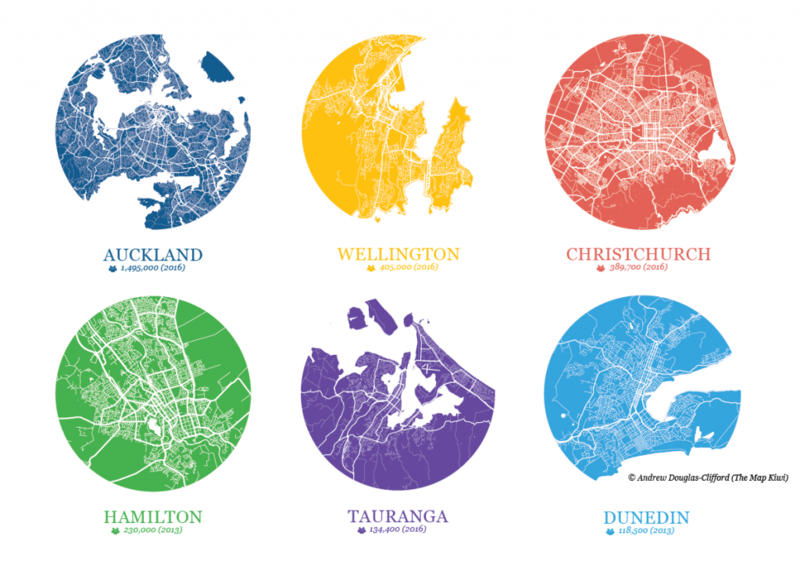 Thank you to OpenStreetMap contributors for the data used to create these. 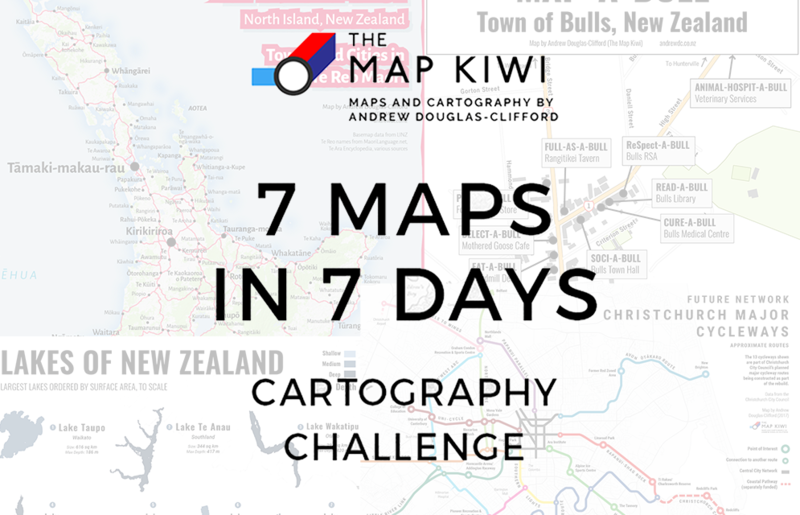 A big thank you to everyone on Facebook, Twitter and Reddit who followed along and supported my 7 days of cartography. It was an ambitious yet very satisfying challenge to pull off. I learnt so many useful things (ideas, data sources, cartographic techniques) along the way out of necessity that will be very helpful in future situations, and of course, it helps to further demonstrate my cartographic skills to others. I plan to refine some of the designs (some ideas need longer to mature) so keep an eye out for revised editions!